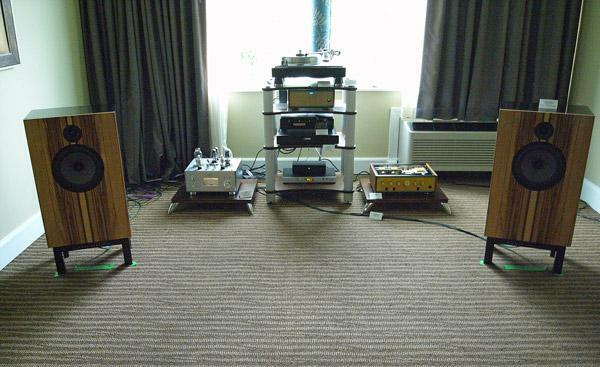 I said in my first story from this year’s Capital Audiofest, the third overall and the second to be held at the Crowne Plaza Hotel in Rockville, MD July 1316, that this wasn’t like other audio shows. On the positive side, CAF had a great atmosphere, friendly and collegial, with great organization from Gary Gill and his team. The hotel had a goodly number of rooms with manageable acoustics, and the hotel staff was friendly and supportive. The live music was superb. Every showgoer I spoke with said that they were having a great time at CAF, that the Metro Washington DC area really does need a show like this, and it was great to hear so many products. And the nightly rafflemy photo shows Gary Gill holding up one of the prizes at the Saturday evening eventwas an excellent draw, with the big prize a Benchmark DAC 1 D/A headphone amplifier. As you can see from the massive 1930s cinema-style horn system that graced the Crowne Plaza’s Salon I, there was a significant retro vibe to the 2012 Capital Audiofest, something that became clear as I started my sweep of the second-floor rooms. Lunch and live music both over, it was time to head back to the exhibits. First stop on the third floor was one of the rooms from Metro Washington DC retailer Command AV, featuring DeVore Fidelity’s Orangutan/96 speakers ($12,000/pair). Combining the unorthodox coupling of a 1” silk-dome tweeter with a 10” paper-cone woofer in a stunningly finished, wider-than-it-is deep enclosure, the O/96 offers a equally stunningly high sensitivity of 96dB/W/m. I had heard the O/96s at Artie Dudley’s a couple of weeks back and was impressed by how the O/96 matched the midrange magic of vintage speakers while adding things I deem essential, like highs and lows. The speakers sounded as good at CAF as they had in upstate NY, both speakers and room stepping out of the way of the music on the Ray Brown/Duke Ellington duo LP This One’s For Blanton. Back in the atrium, I set myself up with a Newkie Brown and a surprisingly good bowl of gumbo and sat back to listen to the set from Janel Leppin and Anthony Pirog, on electrified cello and electric guitar. Anthony, of course, has the 21st Century guitarist's usual battery of delay pedals, loop units, fuzz boxes, swell pedals, of course but so did Janel! 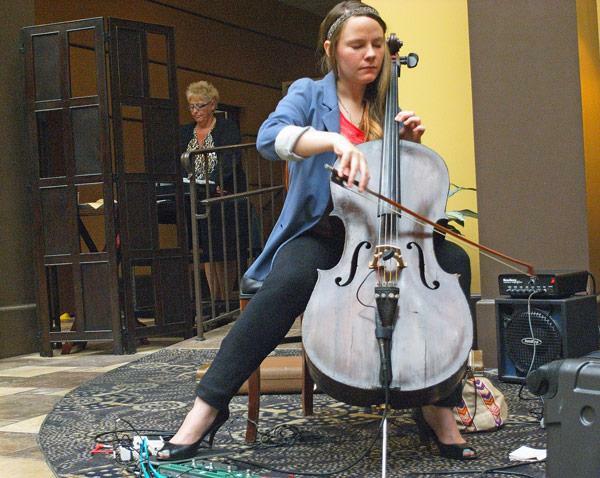 She alternated long, lyrical melodic lines with strummed and pizzicato accompaniments, the two players creating ambient soundscapes reminiscent of what Robert Fripp was doing 20 years ago but with the cello adding a more human element. After the set, I picked up a copy of their album Where is Home? (CD or LP, Cuneiform Records), but the recorded sound, while conventionally good, is a shadow of what the duo create live. 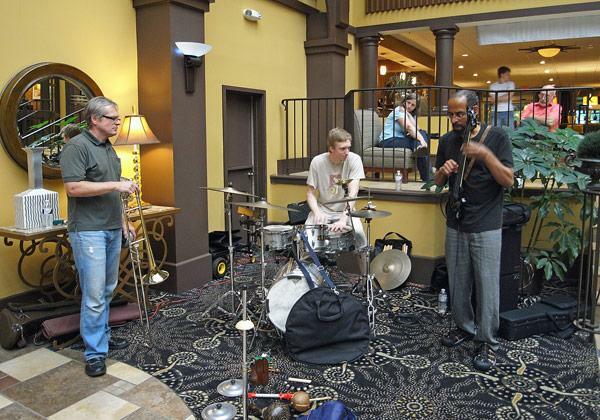 I started off Saturday morning at the Capital Audiofest by revisiting Salon II in the Crowne Plaza’s atrium, where I chatted with AIX Records’ Mark Waldrep. Recently the subject of a fascinating interview on AudioStream.com, Mark has been a voluble and ubiquitous advocate of high-resolution surround-sound recordings. At CAF, however, he was using headphones to demonstrate his AIX recordings. But with a differenceto the left of my photo you can see a Smyth Realiser, which allows full surround-sound to be experienced on headphones (see “Music in the Round,” November 2010). 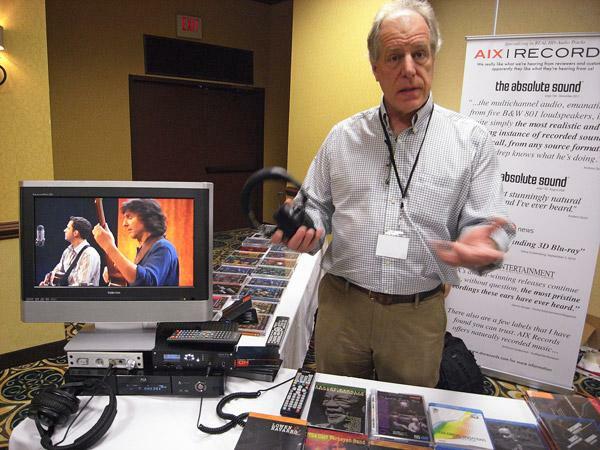 On the DVD-R versions of AIX releases, Mark has included full-resolution 2-channel FLAC files prepared with the Smyth Realiser from playback of the original multichannel recordings on his reference system. I tried one of these files, called “Headphones [xi],” and was impressed. The soundfield extended well outside my head, with good localization of the rear-channel information. In effect, I was transported via headphones to Mark’s listening room. The Capital Audiofest is not like other shows, which was emphasized when I finally walked into the atrium of Rockville, MD’s Crowne Plaza Hotel. There was show organizer Gary Gill wailing on trombone in a set of free jazz with drummer Kirk Kubicek Jr. and bass player Harry Walker. Walker was playing/stroking/tapping a fretless Ashbory Bass, which makes up for its short 18” scale length by having very thick, heavy silicone-rubber strings. Despite the unstructured nature of the music, the trio created fascinating and compelling soundscapes, rivaled only by those created in a later set by headlining act Janel Leppin and Anthony Pirog, on electrified cello and electric guitar, respectively. Just nine days after Independence Day, the third annual Capital Audiofest unfurls its banner with the hope of life, liberty, and good sound for all. 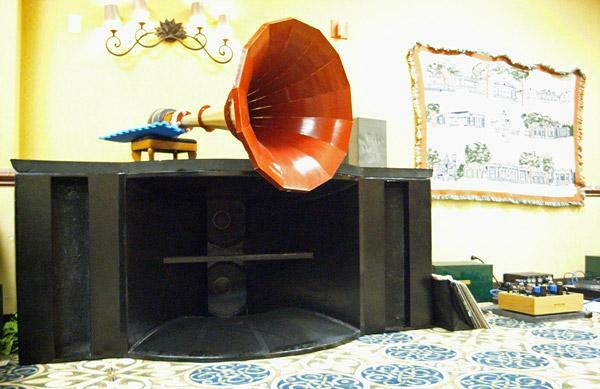 Scheduled for July 1315 in the three-story Crowne Plaza Hotel in Rockville, MD, the show promises up to 40 exhibit rooms stocked with enough high-quality equipment to send Paul Revere galloping from port to post declaring, "The Audiophiles Are Coming!" 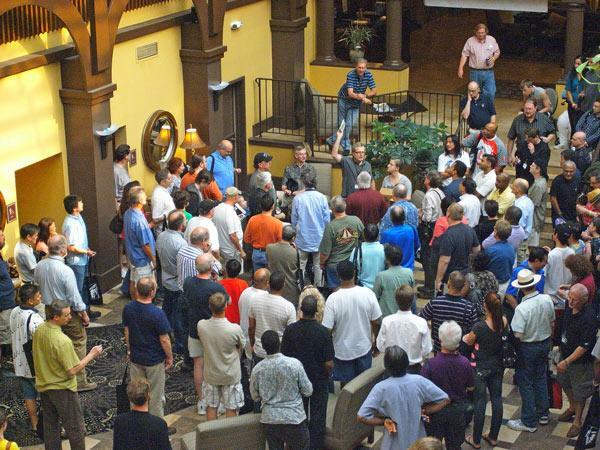 For a one-man effort that began with 14 or 15 rooms in a Rockville mansion, the Capital Audiofest has grown considerably in its short existence. An idea birthed at a partya group of well-lubricated audiophiles, meeting for their annual post-CES bash at the home of Ijaz Kahn, sat around lamenting that there hadn't been an audio show in DC since the 1980s, and when they had finally sobered up, exactly one, Gary Gill, pictured above at last year's Show, found himself committed to following throughthe Capital Audiofest has expanded into a major show that will draw upwards of 1500 eager attendees from as far as Canada, Florida, and the Midwest.